gpe-scap is an gui-application for taking screenshots of your mobile phone. 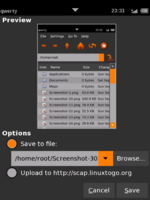 It offers the possibility of saving the taken screenshots or uploading them to http://scap.linuxtogo.org . gpe-scap is in the offical 2008.8 repository and can be installed with the gui-installer via: "INSTALLER -> install -> Miscellaneous -> gpe-scap". Create a simple shell script, which calls gpe-scap after five seconds. Place it in /usr/bin. chmod +x. Replace gpe-scap in the line "Execute = gpe-scap" in the file /usr/share/applications/gpe-scap.desktop with the name of the script file. Now, when you start the screenshot application via the GUI, not much will happen. You have five seconds to switch to the application you wish to capture. The gpe-scap window will automatically pop up with the current screenshot, if it was successful. Now you get a perfect screenshot of whatever you want.